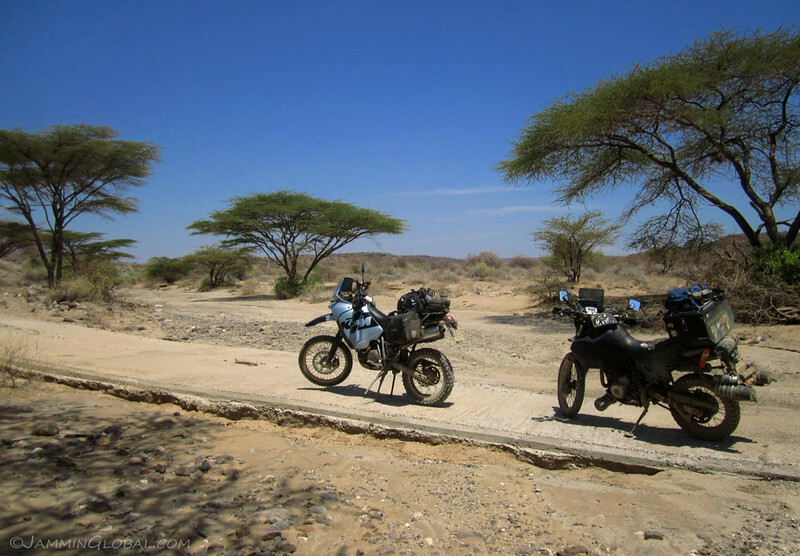 The first leg of the Lake Turkana Route, from the border with Ethiopia to Loyangalani, was an epic journey through an untamed part of Africa. I only had two falls in the sand and quickly got to grips with the loose surface and started enjoying myself over the desert landscape. 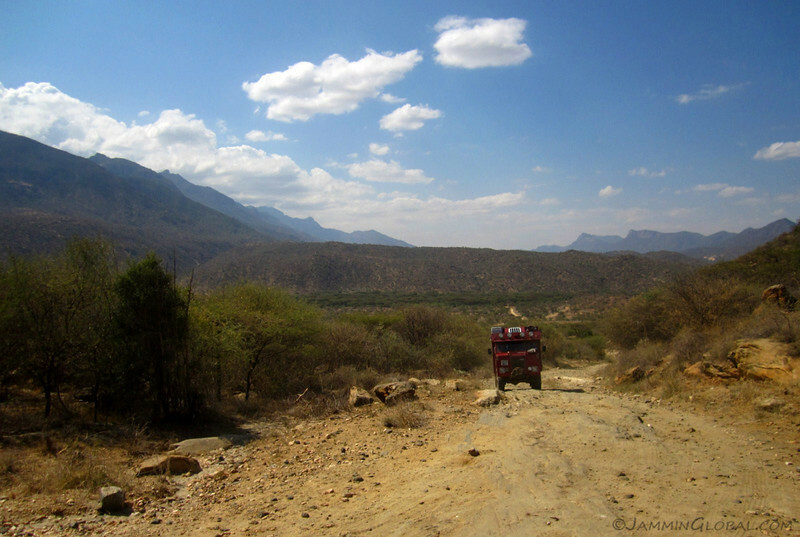 After a day’s rest in Loyangalani, our convoy of a Land Rover motorhome, a KTM 640 and sanDRina set off on the next leg, heading south, away from the lake and towards the town of Baragoi. 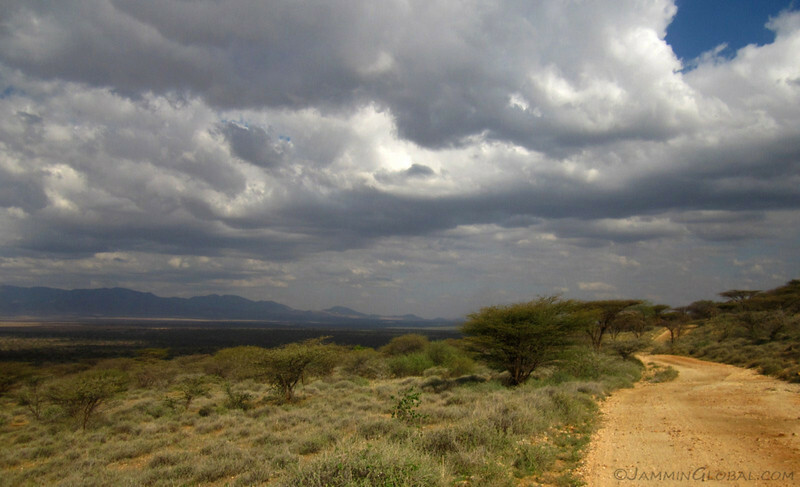 The landscape changed from desert to savannah with acacia trees dotting this big sky land of the Great Rift Valley through Kenya. 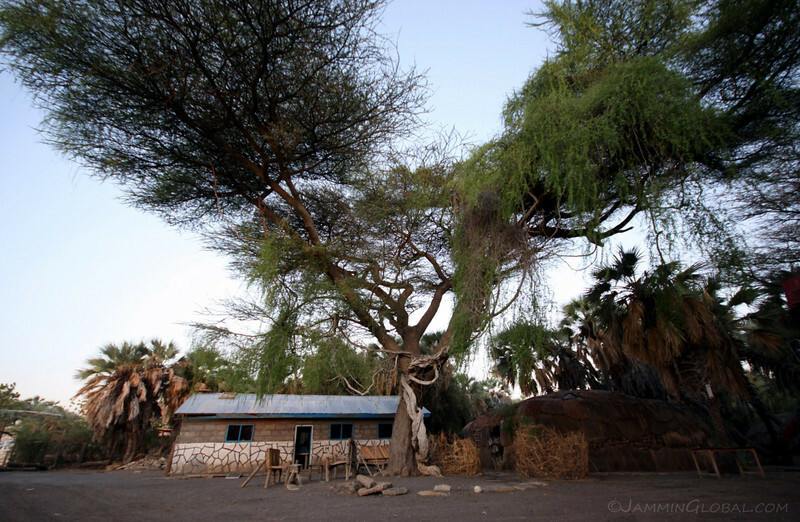 The Samburu Women’s Camp in Loyangalani, a respite in the desert. 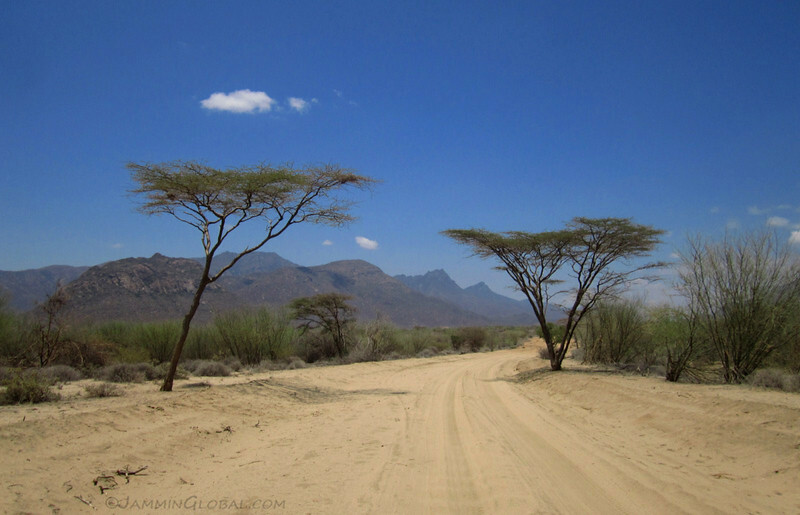 Mama Samburu, a headstrong woman successfully running this campground that’s mainly used by overland travelers and others who venture out this far. She was very friendly and helpful in getting things like local SIM cards and a mechanic for Peter and Jill’s Defender that was suffering from a broken suspension mount. 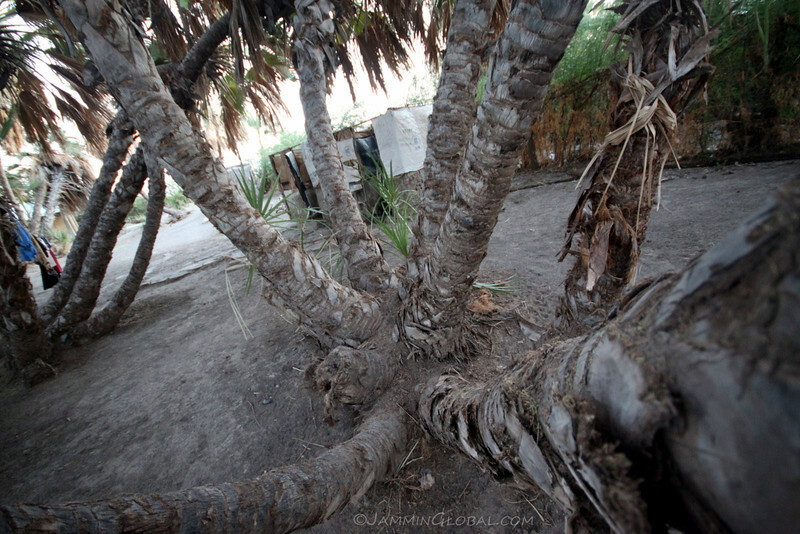 The campsite was shady with palm trees and the constant stiff breeze that Lake Turkana is known for made it comfortable during the heat of the day. The best feature of the campsite were these open-top, always-running hot showers. 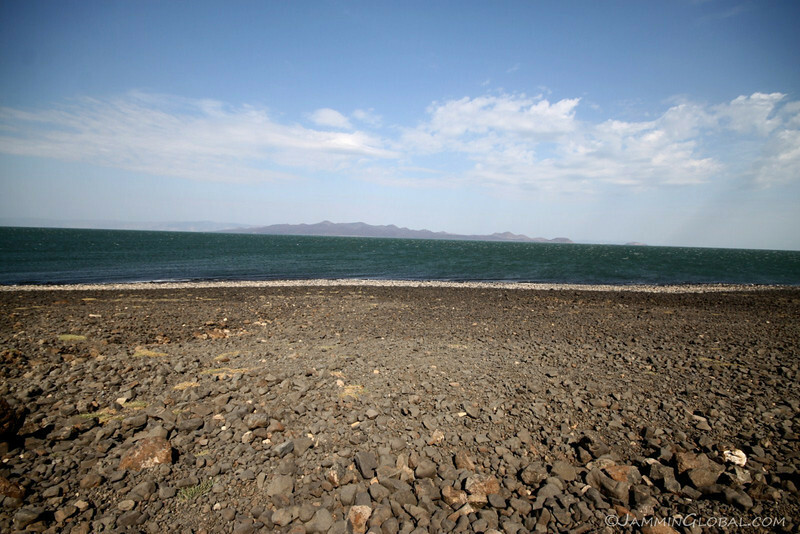 Lake Turkana is defined by volcanism and there are hot springs nearby that the showers are tapped into, so they’re constantly flowing and there’s no guilt in having a half hour or even a full hour shower. I took four showers during my day off, with the last one being a night shower where I spent a long time staring up at the stars while being bathed in warm water. 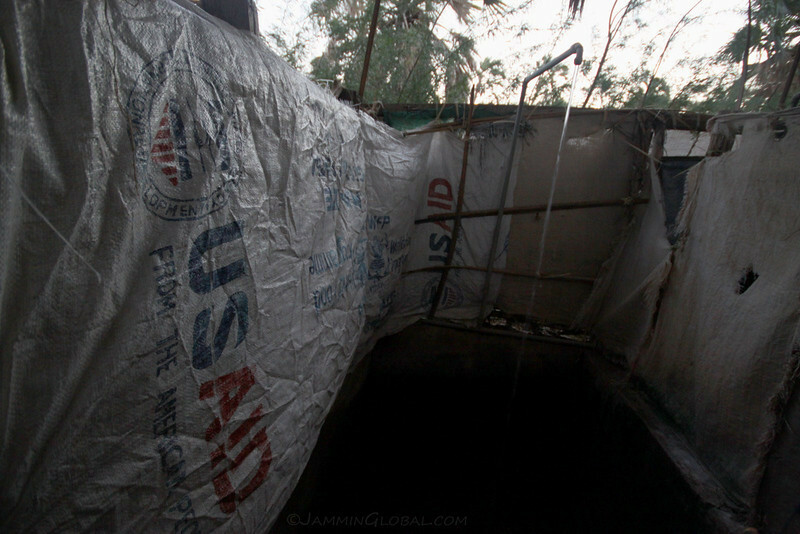 Oh and thanks to US AID for providing the durable shower lining. The sacks they use to distribute food aid are known to be of high quality and are priced for their multiple uses. Carlos giving some TLC (tender loving care) to his KTM 640 by washing off all her dirt. I used to be like that with my GSX-R600 and kept her in pristine condition but with sanDRina, washing her doesn’t make sense and I think it wears off some of her character. There’s probably dirt on her all the way from Bolivia! 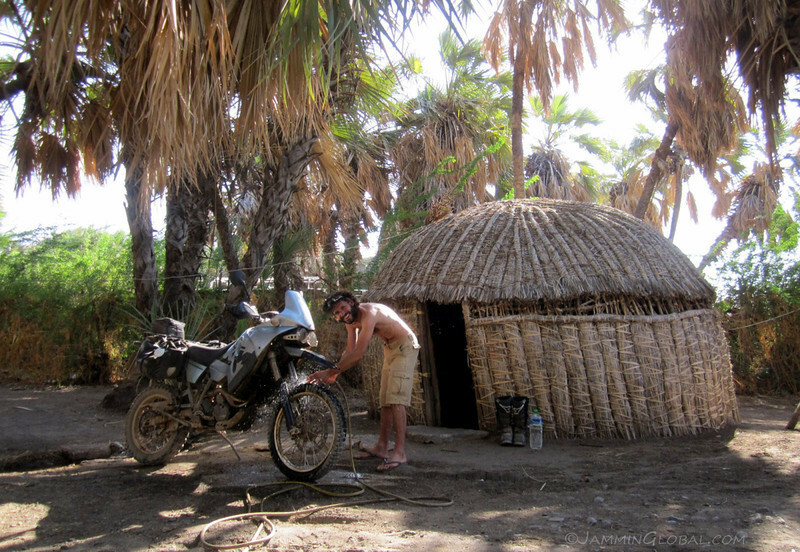 Camping in our tents was the same price (K600, $6.50) as staying in these Turkana huts, so we bikers opted for that. 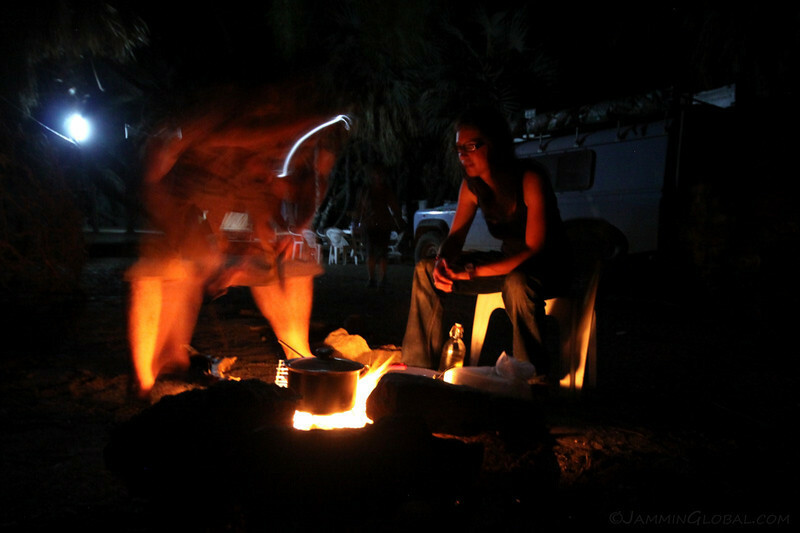 Guy and Lu preparing dinner for us at the Samburu Women’s Camp. 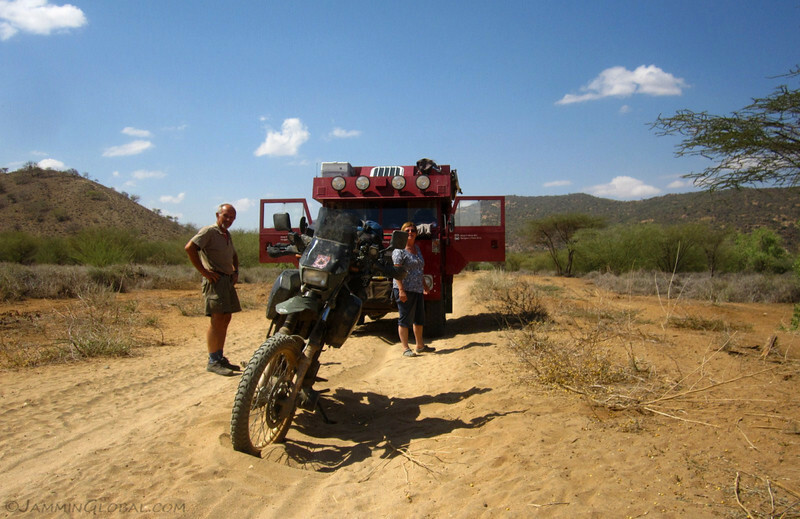 They were circumnavigating Africa in their blue Defender, giving about a year for the journey. 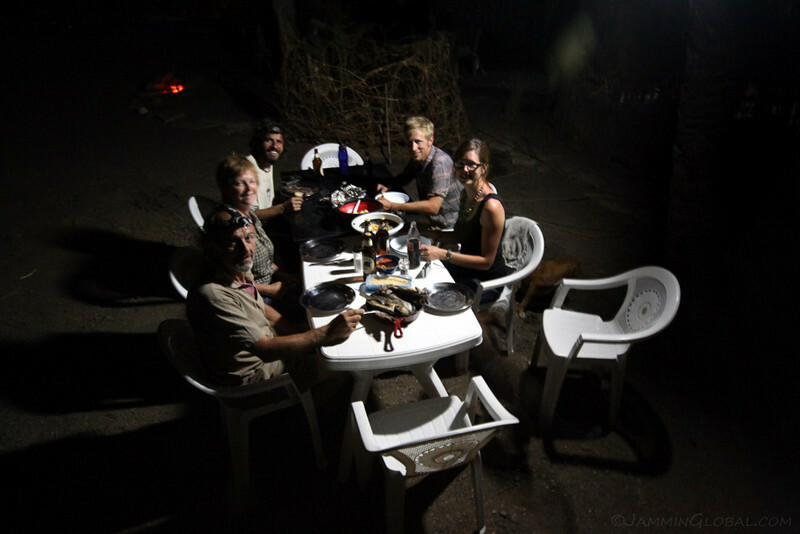 Happy campers in Loyangalani: Peter and Jill, Carlos and Guy and Lu. A dinner of grilled fish and Kenya’s Tusker beer. …he was back in two hours as he hit his reserve within 16 kms (10 mi). After making fun of me for carrying so much fuel, here he is taking some of my extra reserves, hehe. I’ve learned to ignore the chidings from other bikers when they complain about how much stuff I’m carrying and all the planning that I do for rough stretches, because it’s me who smiles when things don’t go according to plan and my contingencies come into effect. 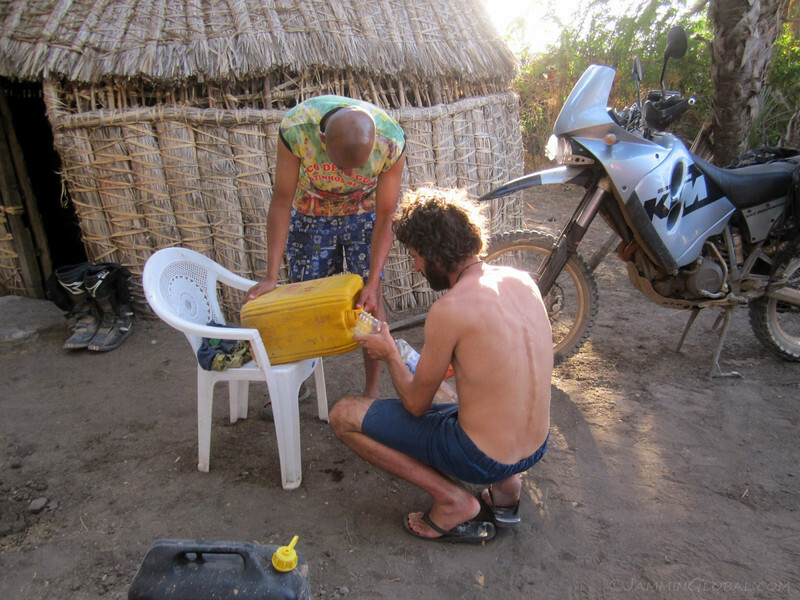 I left with a full tank of 40 L (10.5 gal ) of petrol and then had two 20 L jerrycans of petrol in the accompanying motorhomes. 80 L (21 gal) of petrol for 900 kms (560 mi) of offroad might seem like overkill, but not when I’m sharing that with others. After another relaxing evening in Loyangalani, our convoy of three set off the next morning. 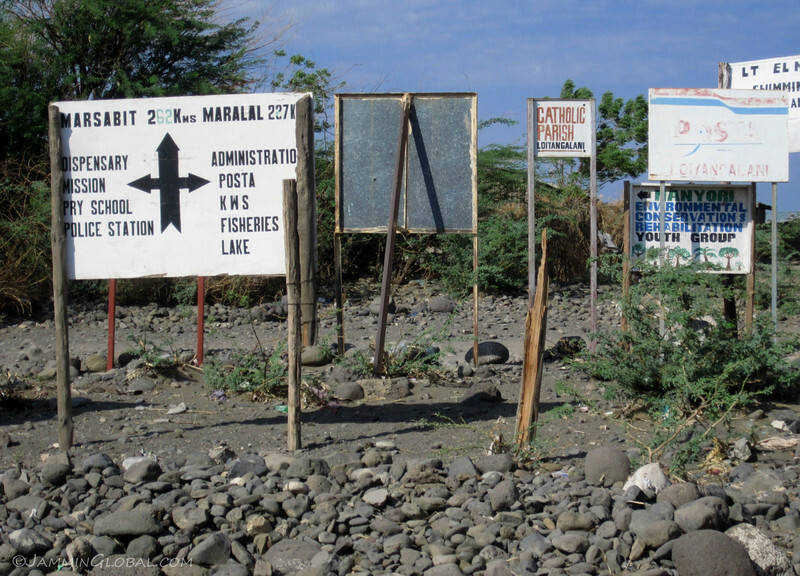 A sign just outside Loyangalani showing that going east would take us to Marsabit, but we were heading south to Maralal, the end of the Lake Turkana Route. 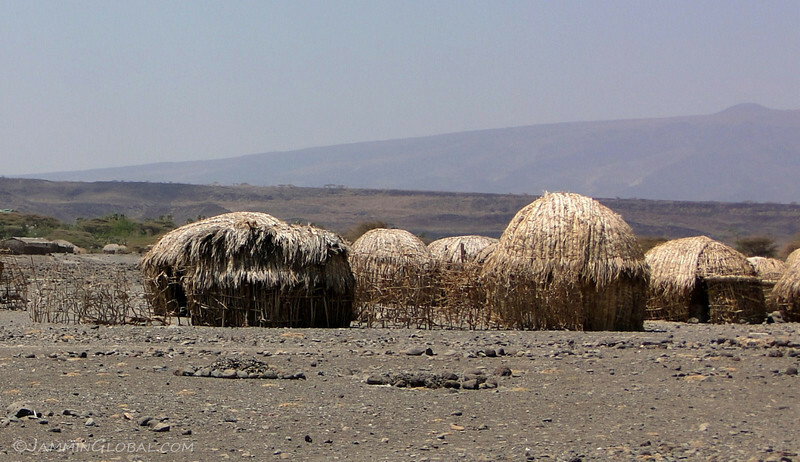 A gathering of huts from the Turkana tribe, after whom the lake gets its name. The people have adapted to their environment as the huts are designed so that they can withstand the constant winds around the lake. 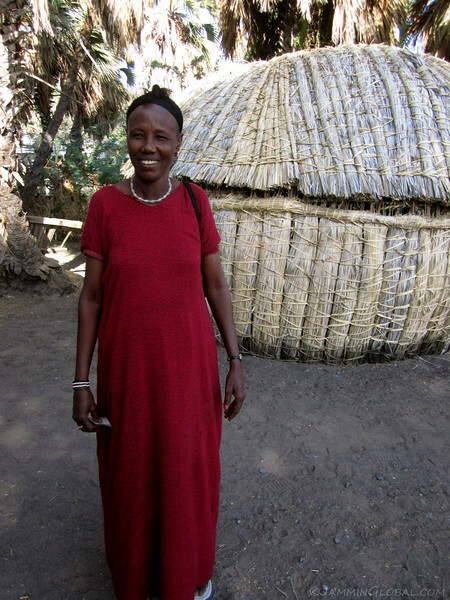 They were less affected by British colonialism than other tribes in Kenya due to the remote and harsh land that they live on and thus their traditional culture is still strong. Riding a craggy track with a huge expanse of emerald waters spreading out in front of us. From Loyangalani south, the route closely followed the lake for a bit and the views were epic. 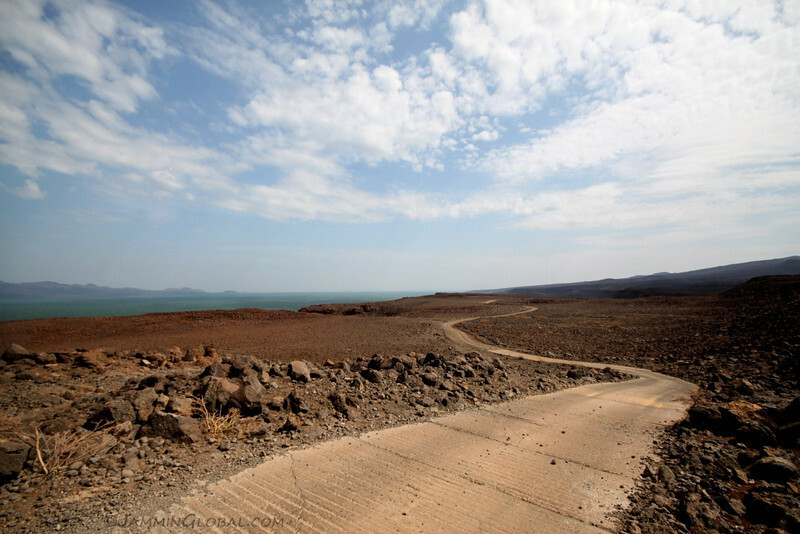 The rocky shores of Lake Turkana, supposedly famous for crocodiles, but I didn’t see any. …ate into my Heidenau K60 Scouts. 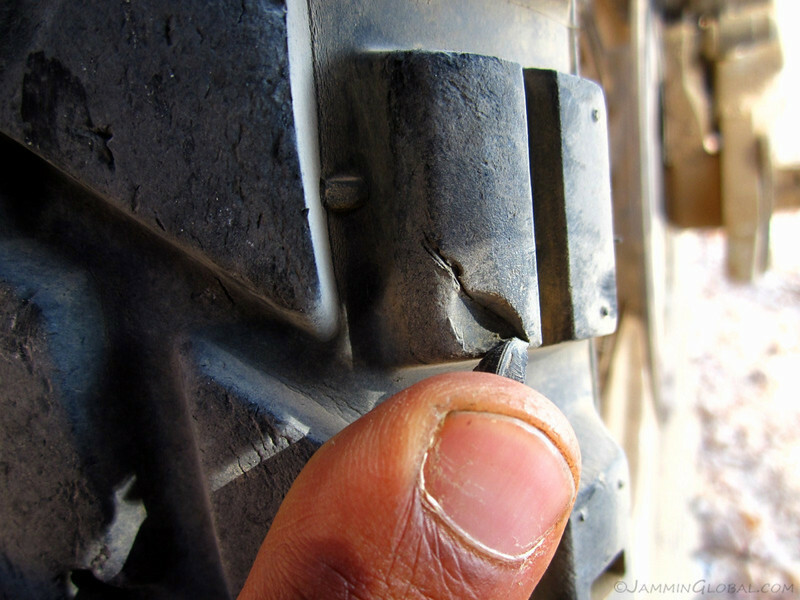 The sharp rocks that I rode over on the Lake Turkana route took bites out of my knobbies but I had no punctures. 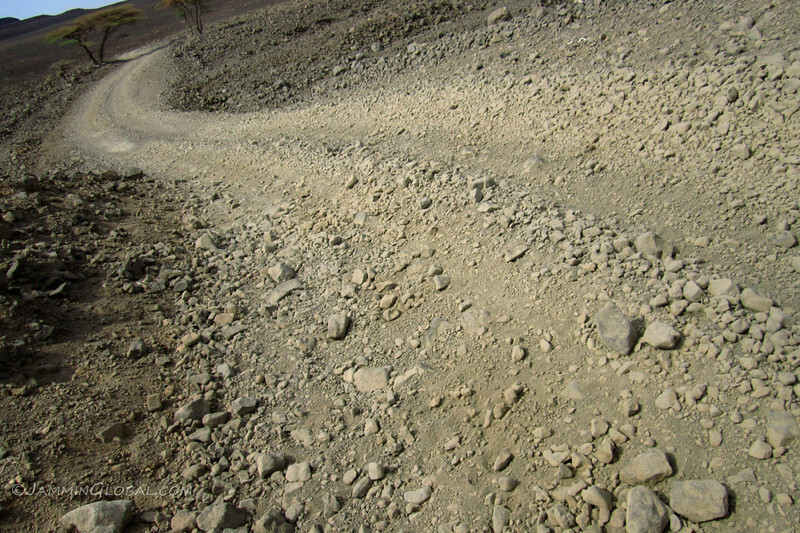 Even though the track is in a very remote area, some parts of it were paved in concrete, such as steep uphill sections where grip on the loose rocks is lacking. 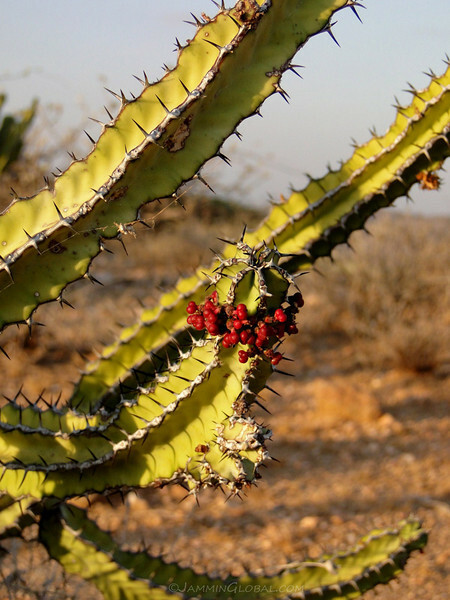 Cactus berries. Ferdi and Katie left a day before us and shared these next few photos with me. 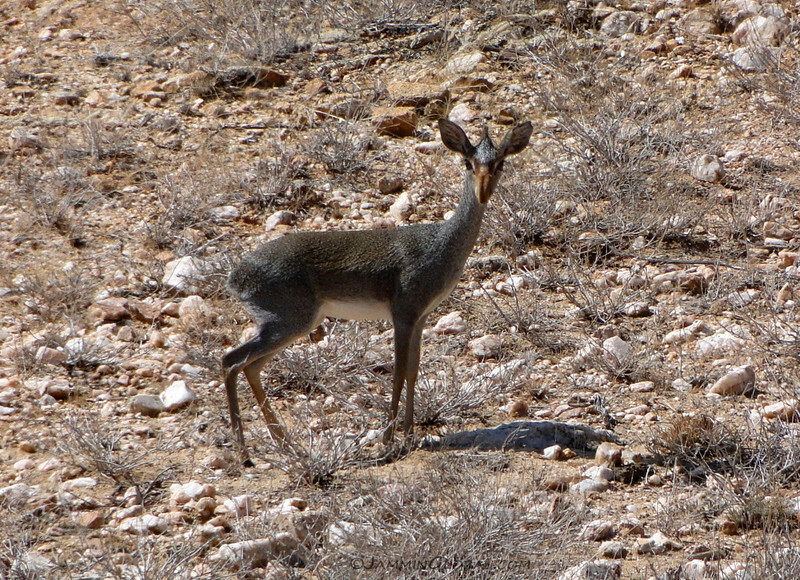 …Dik-dik, a small antelope that lives in the shrubland of eastern and southern Africa. 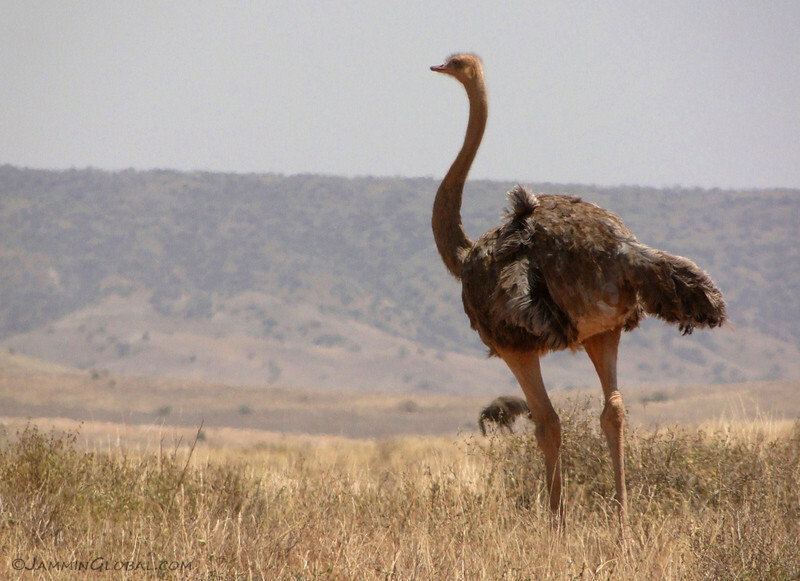 An ostrich, standing tall over Kenyan savannah. 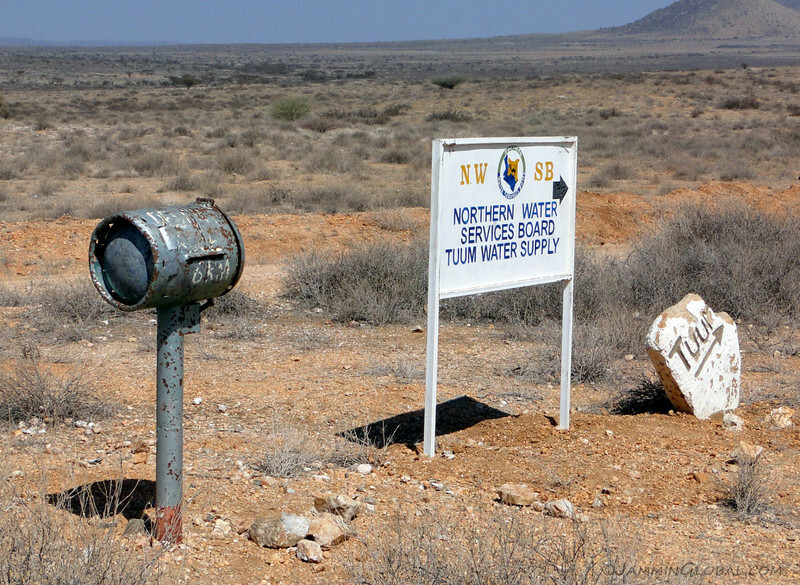 A cooking gas cylinder turned into a mailbox at the turnoff to Tuum. 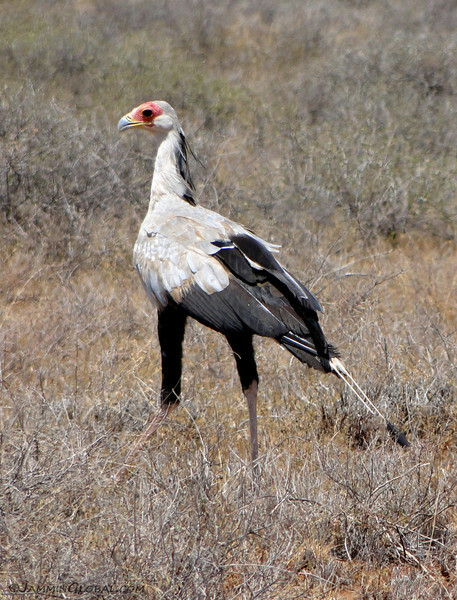 A Secretary bird looking around for lunch. Unlike other birds of prey, it hunts for small prey on foot, rather than from the air. Its name derives from a French corruption of its Arabic name of saqr-et-tair meaning hunter bird. 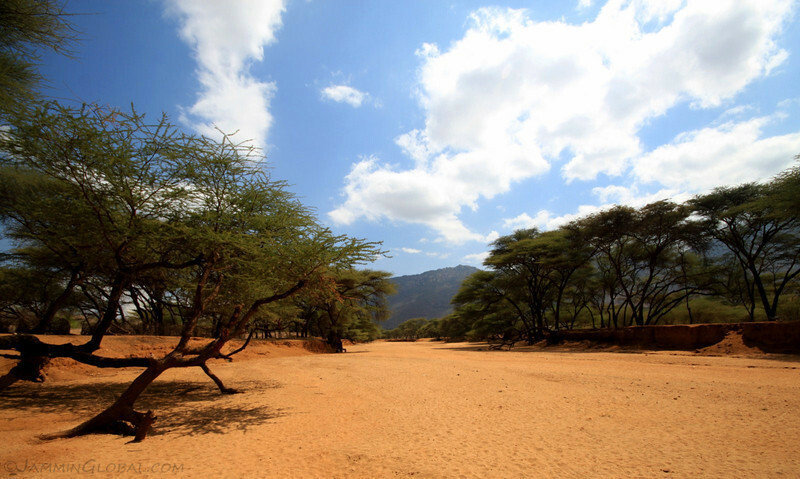 A lone acacia tree in the sands of Turkana. 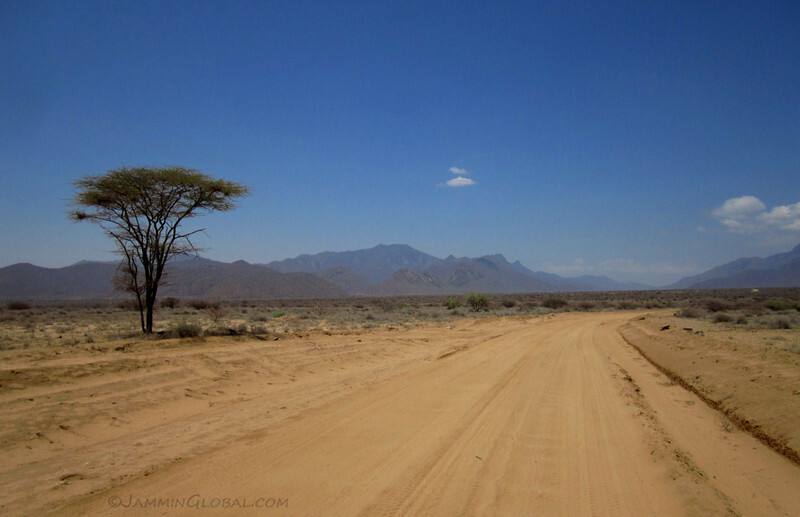 Leaving Lake Turkana behind, the route went across some open dryland as it headed for that valley up ahead. Riding the 50/50 Heidenau K60 tire over a variety of surfaces. 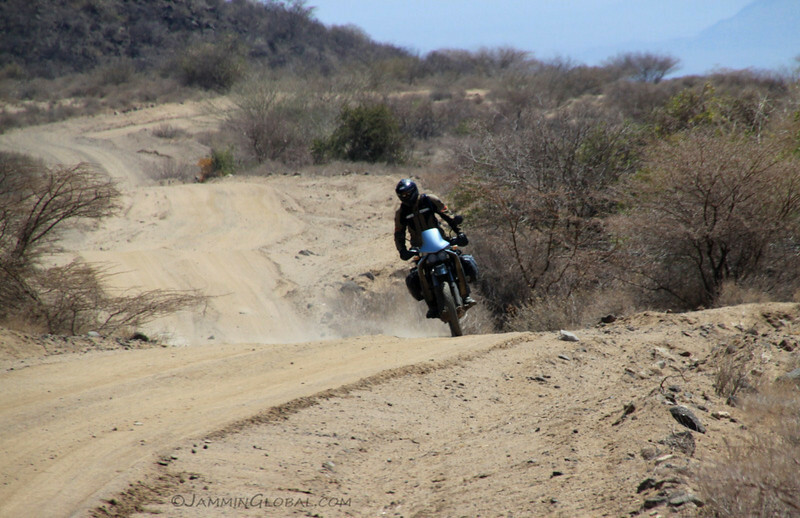 I was used to the sand by now and was keeping up with Carlos, a more skilled offroad rider. The vegetation picked up the further south we went with the sand keeping up. 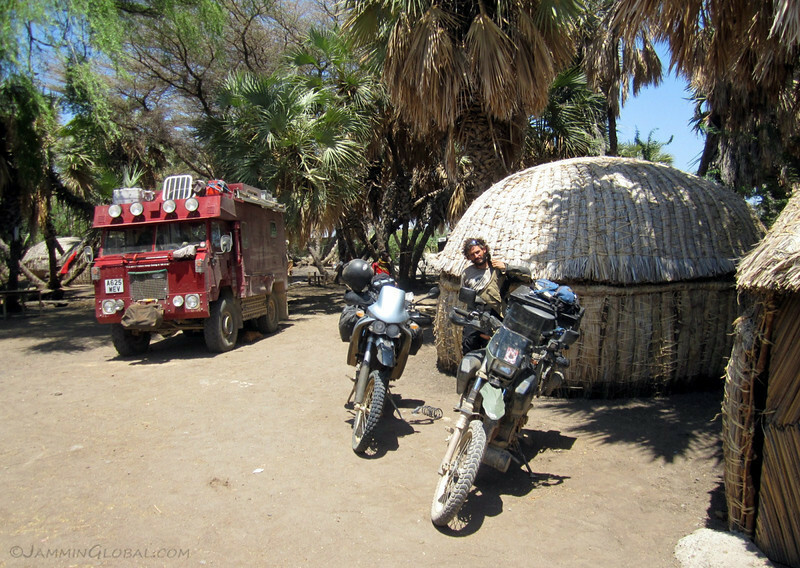 Enjoying the Lake Turkana Route with sanDRina being lighter than normal. …Carlos who was taking some respite from the heat. 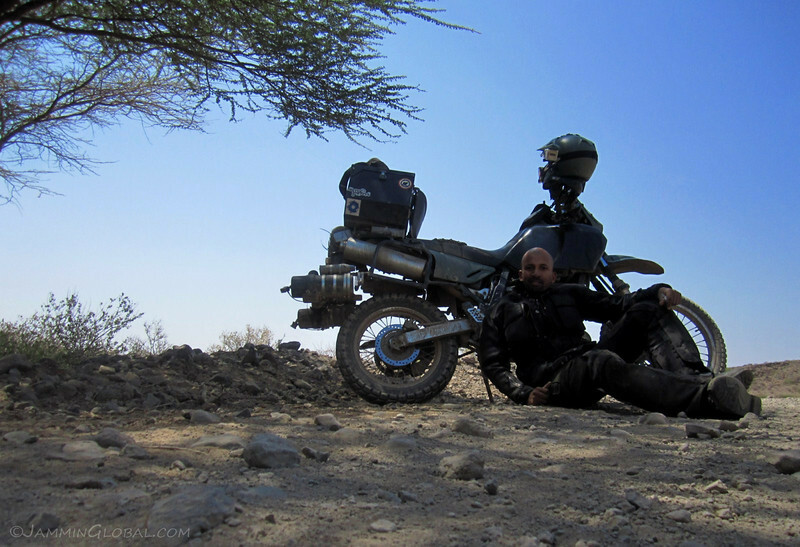 Carlos riding the Lake Turkana route. 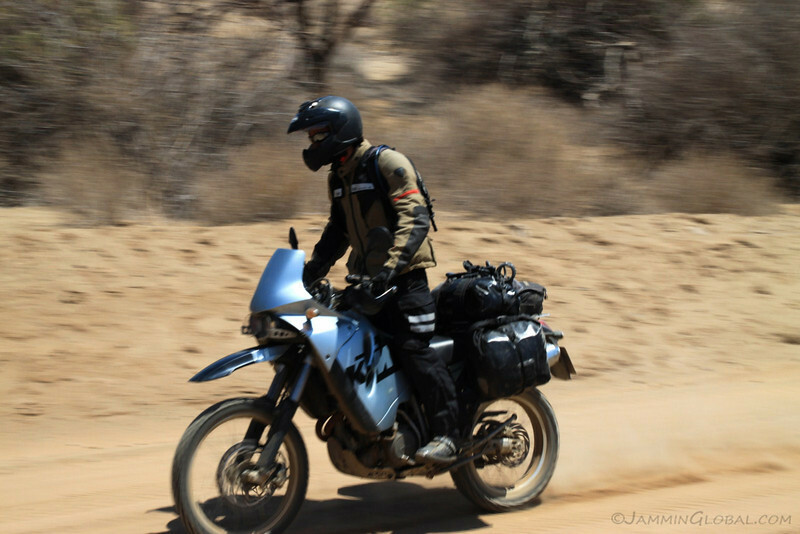 His KTM 640 was setup much lighter than sanDRina, which is ideal for offroad touring, but I prefer hard boxes for safety and stickers! 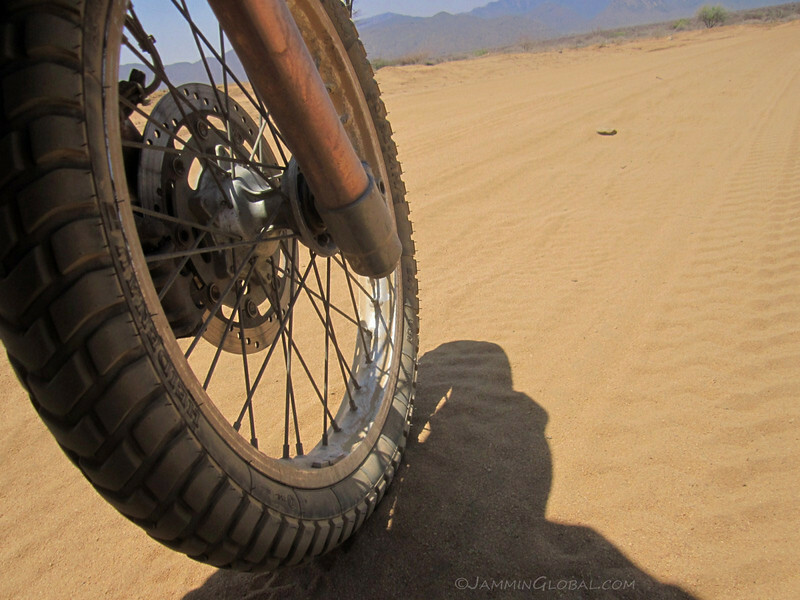 Riding the sands of the Lake Turkana Route. 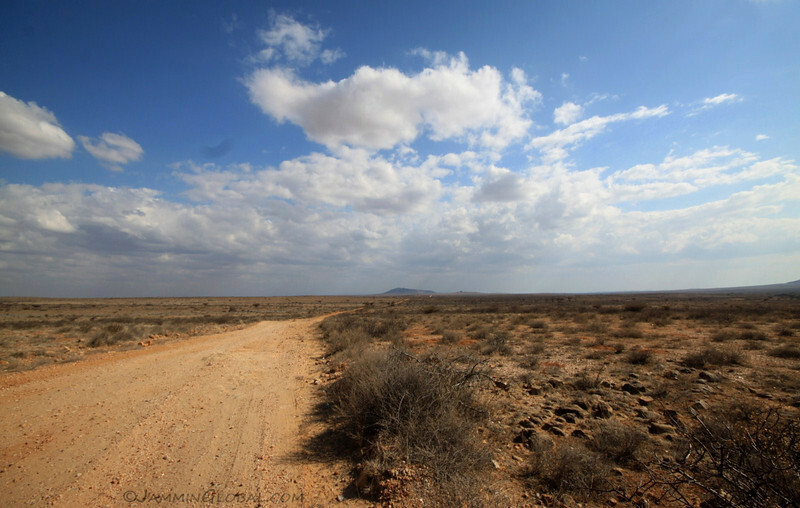 Blue and brown, two of my favorite colors, in abundance in Kenya’s Big Sky country. The trees got taller and the color of the ground changed as we rode past South Horr, getting greener and redder. …made for a nice stop for lunch. 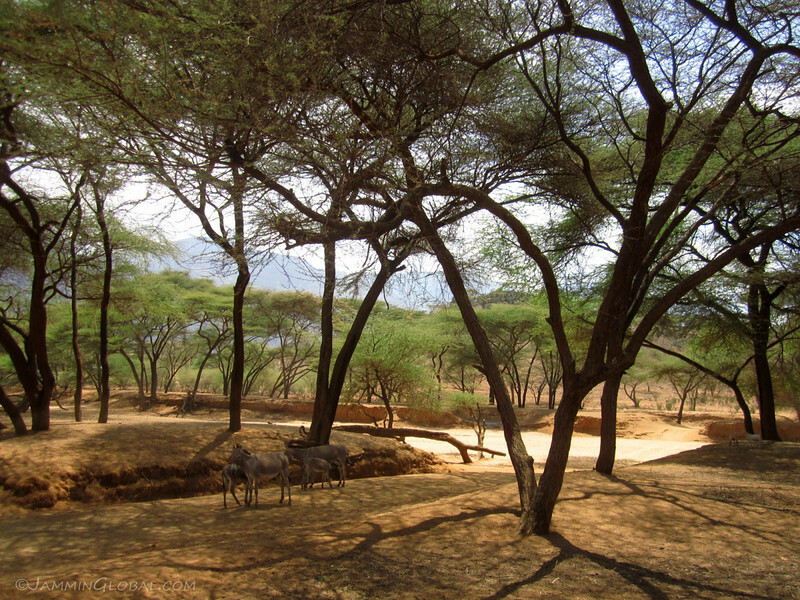 These donkeys thought so, too, enjoying the shade from the thin leaves of this acacia canopy. 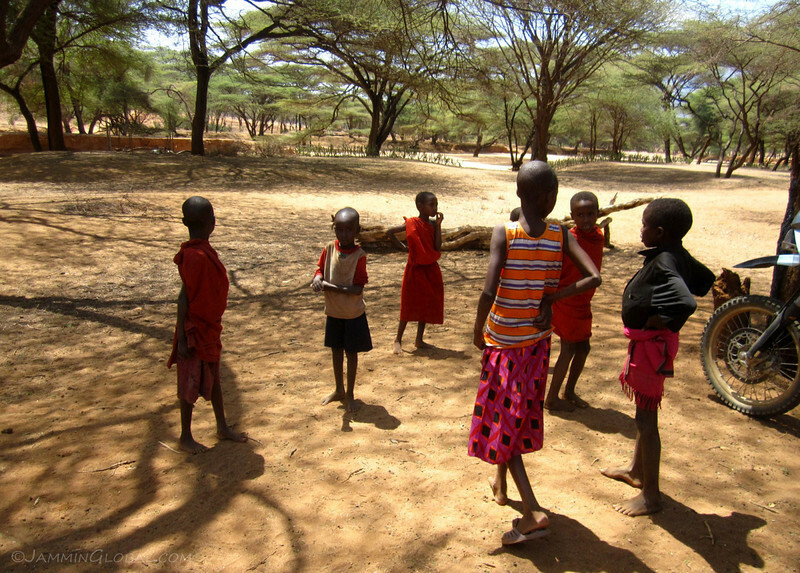 Children from a nearby Samburu village quickly ran over to see what was going on. 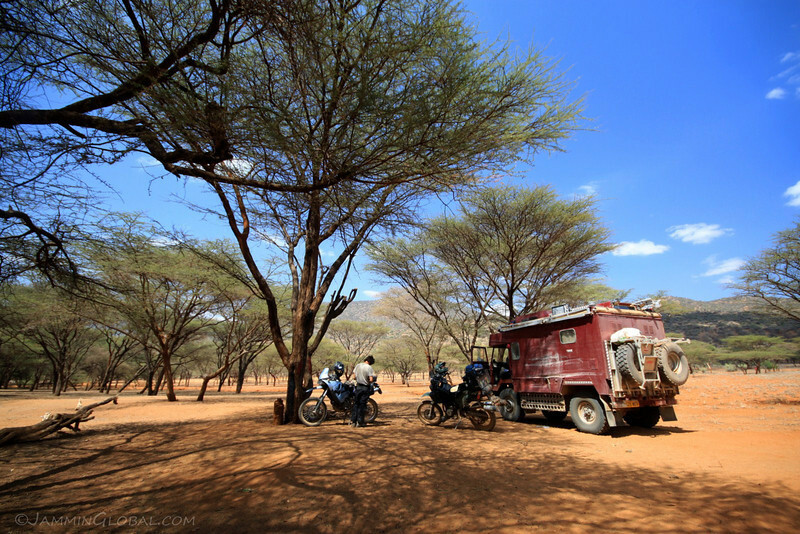 It was a beautiful day to be riding red earth through green acacias under a big blue sky. Oopsie, another drop in the sand. I think that was some brain-fade after lunch and thanks to Peter for helping with the pick up. 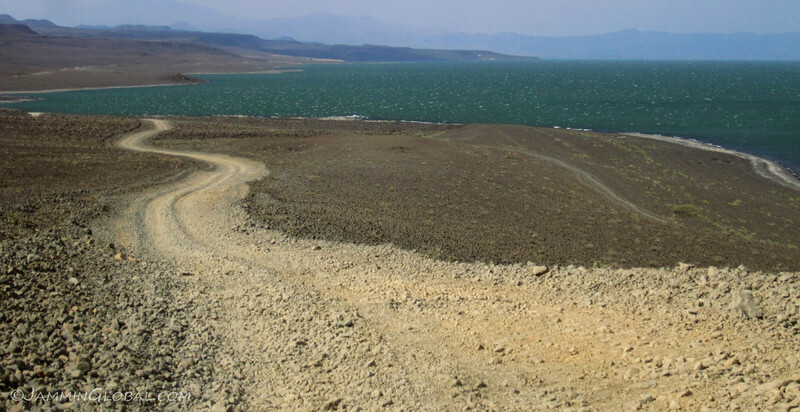 The land rises up from Lake Turkana at 400 m (1,300 ft) to 1000 m (3,280 ft) at South Horr and gets close to 1,500 m (4,920 ft) near Baragoi with lots of steep climbs up rock faces along the way. Peter and Jill’s Defender motorhome slowly making it up the steep climbs. 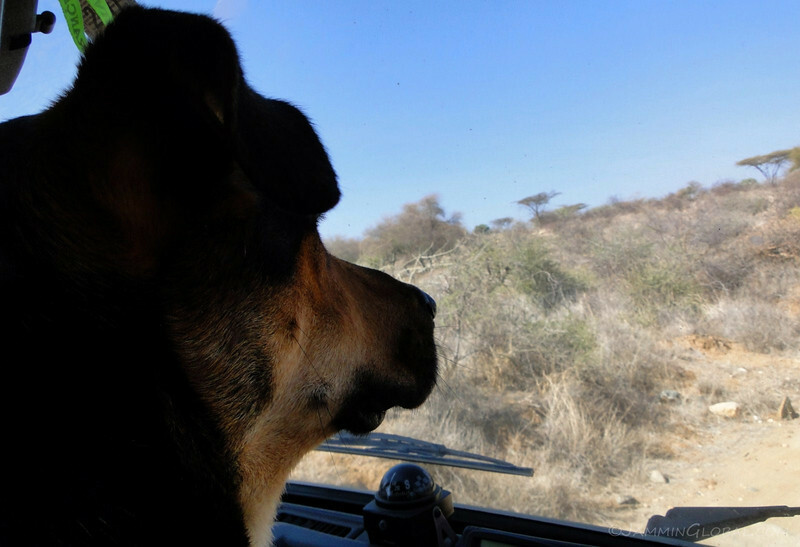 Their truck was suffering as that huge vehicle only had a 1.6 L diesel engine that overheated on long uphill pulls but they would make it to South Africa. 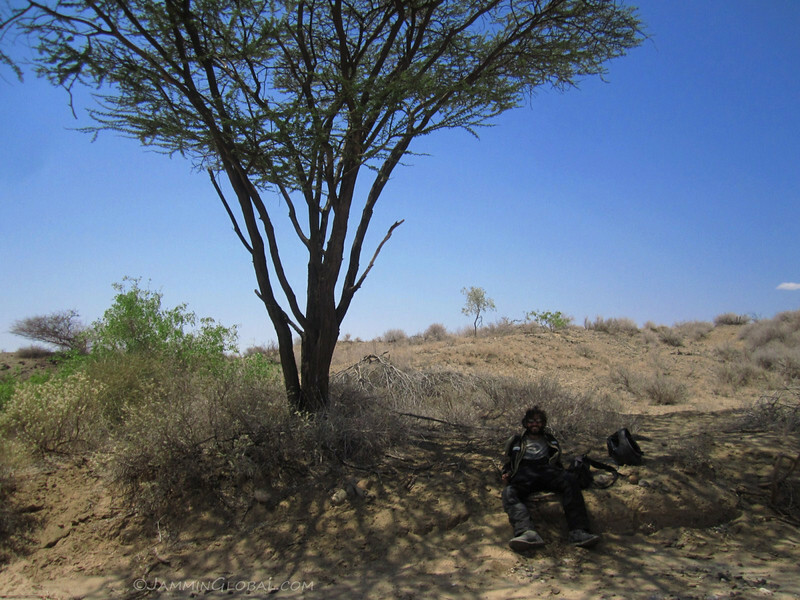 Taking breaks under any shade that I could find as I was enjoying the ride through this beautiful landscape. 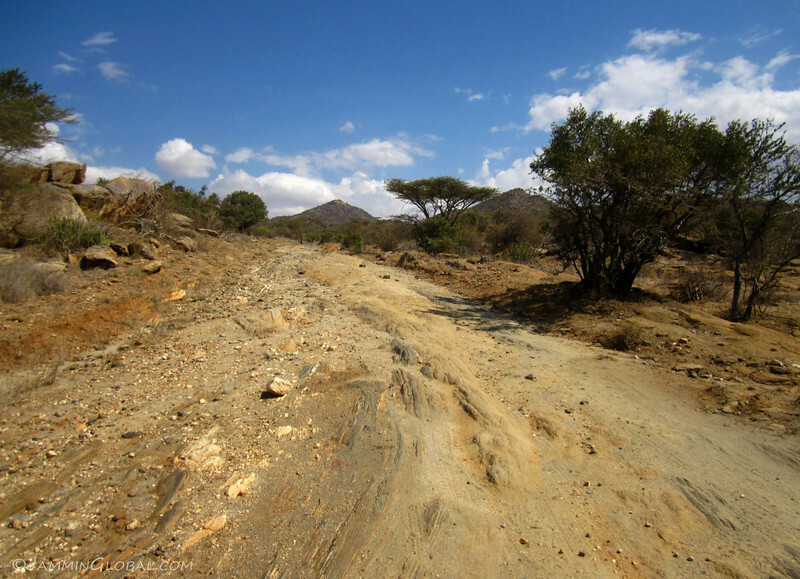 As the route got closer to Baragoi, there were many hills and valleys to traverse with the troughs covered in sand. 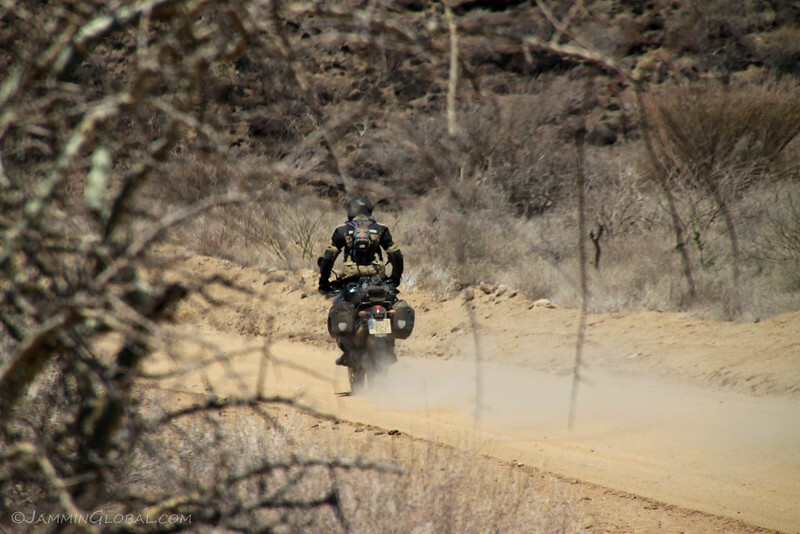 Riding onto big open land in the great valleys of northern Kenya. 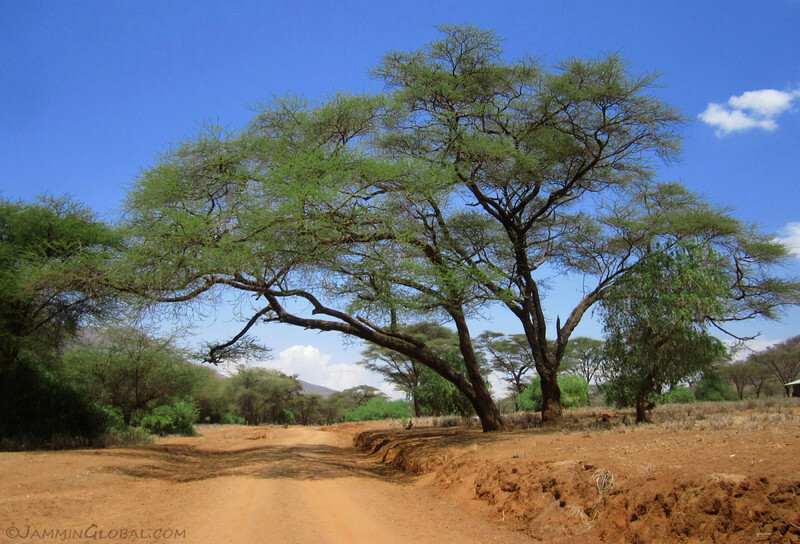 sanDRina catching some shade under this lone acacia tree as the route wound its way across this expansive valley. Heavy clouds as the route started climbing up the side of this huge valley. 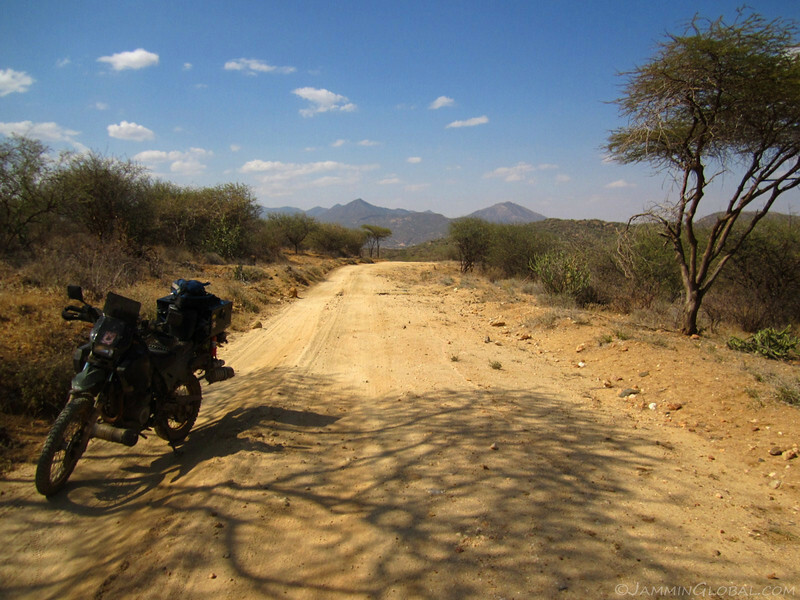 sanDRina, my companion on my journey across Africa. 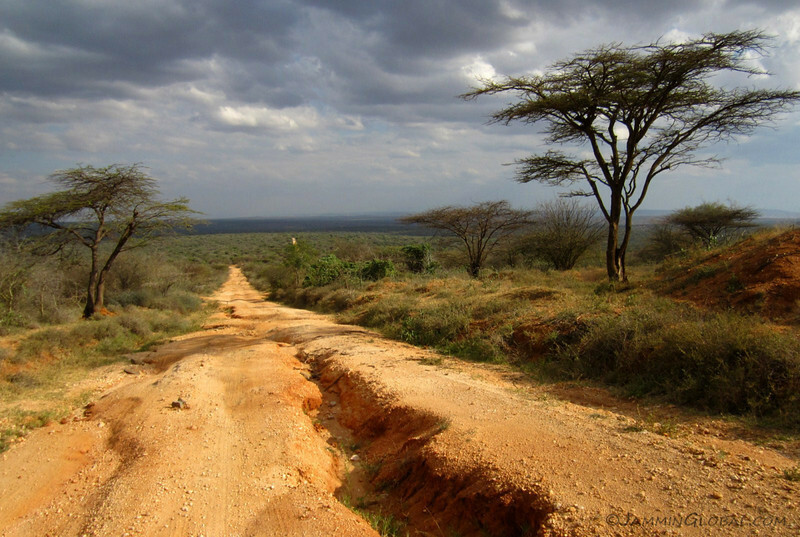 Deep ruts in the road from the rainy season as the land got greener near Baragoi. 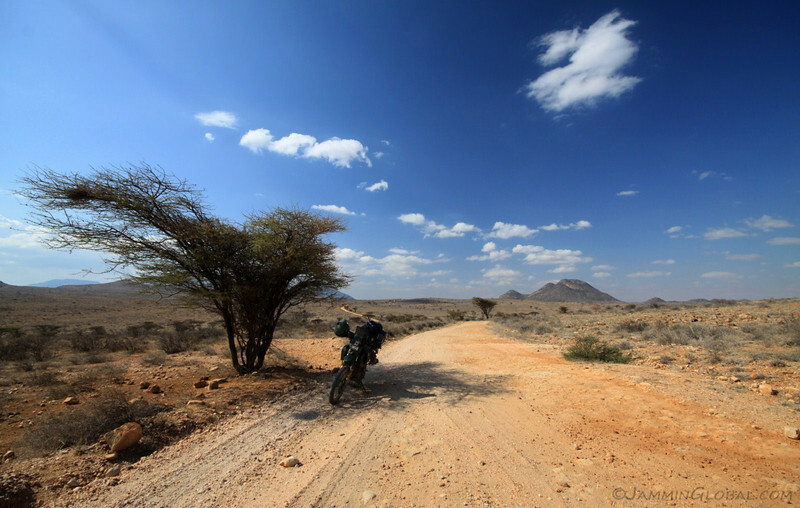 This kind of riding, through wide, open land is what I cherish the most. 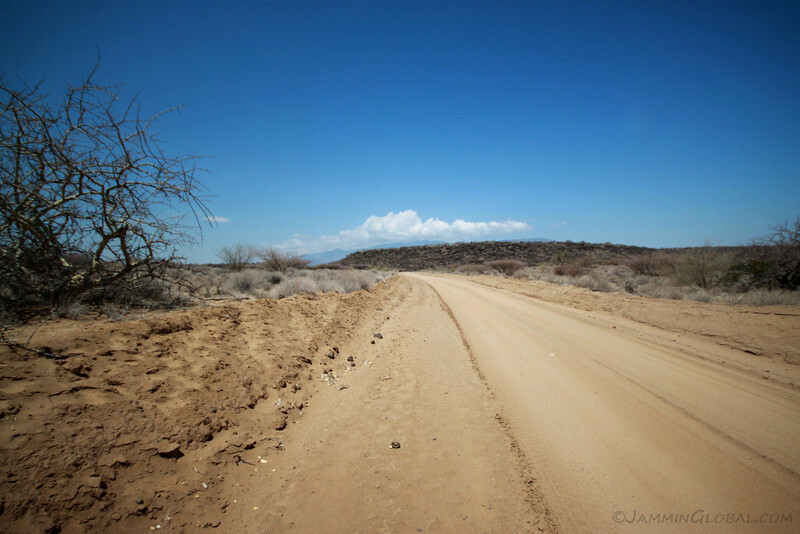 Cultural insights are interesting and meeting local people is enriching but it’s being in wilderness that I crave the most and am glad I could relish the feeling for days on end on the Lake Turkana Route. 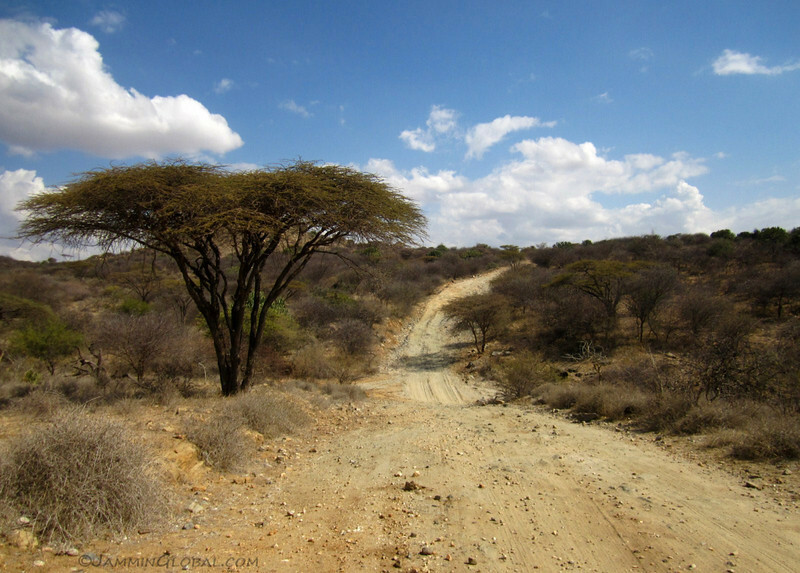 What I really like about crossing huge swathes of wilderness is seeing gradual changes in the land, like the slow change from the rocky deserts around Lake Turkana into the acacia-covered savannahs around Baragoi. This helps me understand how the environment functions on a different timescale than the fast-paced lives of its dominant species, us humans. 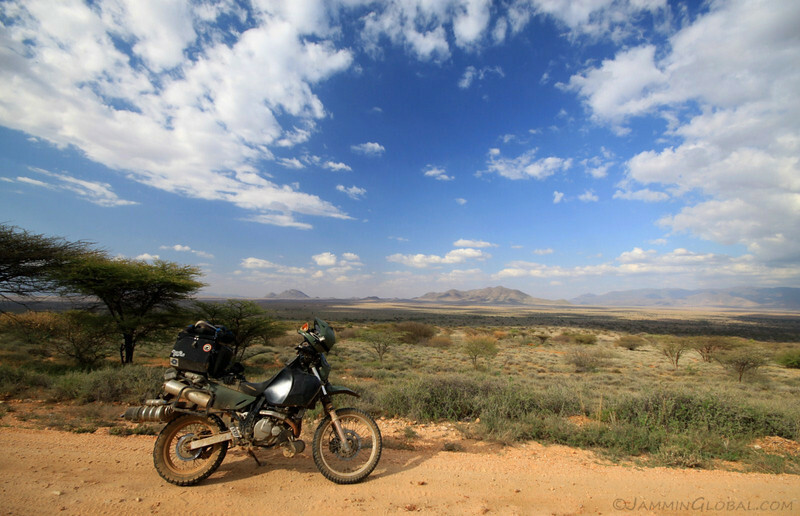 Even though I was riding a motorcycle fast through this big land, its enchancement slows me down and lets me connect with nature. Fantastic post! I like your philosophy on washing sanDRina. I follow the same with Kiki. Your photos are incredible. 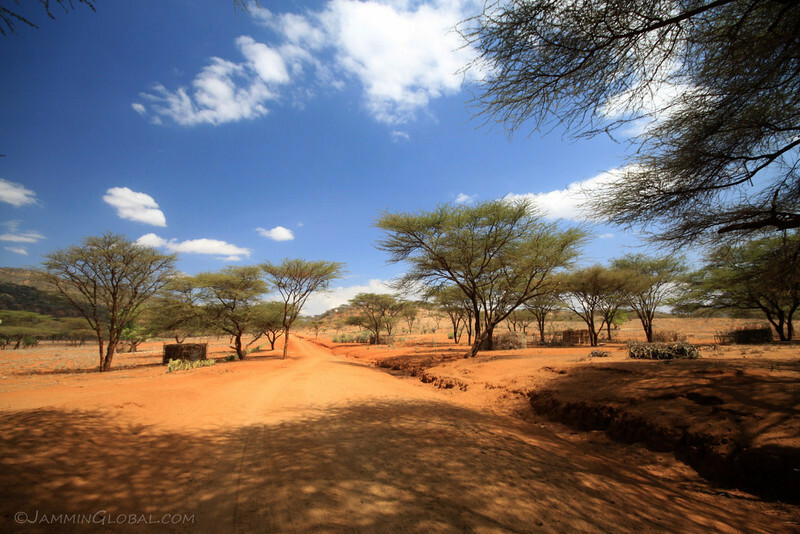 It looks so beautiful there with the blue skies and lovely acacia trees.